NEC brought the latest in point of sale, biometric, analytics, and display technology to this year’s National Retail Federation EXPO (NRF). Nicknamed “Retail’s BIG Show,” NRF presents visionary leaders and game-changing ideas to the retail industry, and the NEC display made a lasting impression with show-goers. A great deal of that talk in the booth centered on NEC’s revolutionary face recognition technology and how it’s helping to make stores more secure while providing valuable analytics to retailers. Today’s shoppers want a more personalized experience and the best possible price. That’s exactly what the NeoFace Engage™ solution can provide – in real time. Integrated with the Microsoft’s Azure IoT Hub, Azure Stream Analytics, Power BI and KAIT, the solution could benefit retailers by tailoring in-store advertising based on shoppers’ age and gender using real-time data and content to make offers and educate shoppers, all while capturing valuable shopper analytics. Another biometrics-based solution, NeoFace® Watch, presented a dramatic leap forward for store security. By integrating with video surveillance systems, NeoFace Watch immediately captures images and matches them against a watch list. Store personnel are alerted to any threats through push notifications to their Apple or Android devices. Enterprise Video Analytics™ (EVA) is one of NEC’s newest biometrics solutions. EVA captures age and gender analytics to track in-store shopper demographics. Attendees of the NRF16 EXPO saw EVA integrated with NEC’s latest point-of-sale(POS) retail options. NEC’s Stanchion® 3.0 retail suite includes hardware, software and services to enable store managers and staff greater access to data, improved communications and increased productivity within their store environments. As store owners know, consumers have more buying options than ever – too many! It has never been more important for retailers to capture a sale at the moment a consumer is ready. 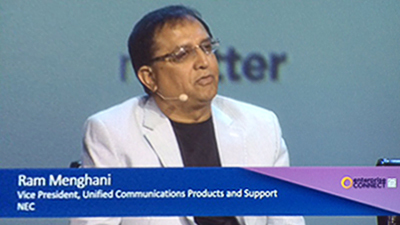 That’s what attendees at NRF16 experienced live with InPosition. This mobile solution takes POS where it’s needed most – to your shopper on the store floor. InPosition also offers instant item look up and detailed product information to deliver top-notch customer service. Many NRF attendees commented that NEC’s Interactive Projection System was a fun, “futuristic” way to order in restaurants. This solution uses projection technology to offer interactive, direct table ordering and can even push coupons and promotions to customers’ mobile devices while in the restaurant itself. Restaurants and grocers were also shown a new approach to fresh item management. NEC’s Fresh Food Optimization solution helps reduce waste and save money by leveraging in-store data to accurately predict fresh food purchases. To gauge consumer traffic, In-Store Analytics utilizes heat mapping to track dwell times at specific products and store locations. If we used this solution at NRF16, the NEC booth would have glowed red-hot. You can’t attend “Retail’s BIG Show” without bringing a really big show, and that was achieved with NEC Display Solutions of America’s breathtaking selection of commercial LCD display and projector solutions. Show-goers were captivated by NEC Display’s video wall solution using X554UNS 55-inch displays. These impressive arrays utilize Impinj RAIN RFID technology to create a unique in-store customer experience. And for a store that wants a huge, ultra-high definition splash, NEC Display showcased the impressive X981UHD 4K 98-inch display. Or for a more interactive presentation, a new interactive kiosk utilizing a 55-inch V552 display with integrated multi-touch technology was on display. All Digital Signage solutions were powered by NEC Display’s new Intel Open Pluggable Specification (OPS) computing solutions designed to enable easier installation, use, and maintenance of digital signage. Based on the booth traffic and attendee response, NRF16 was a tremendous showcase for NEC’s innovative solutions. It’s the time of year when we express our gratitude. Just check any social media platform and you will see various countdowns of thankfulness or 40 days of gratitude. People share all types of things, from being thankful for family and friends, to how their dog makes them happy, to how they love a certain food. Let’s face it – we have a lot to be thankful for! And one of those is the way our lives can be positively impacted by innovation and technology. OK, so it might not make the top 10 list at your Thanksgiving dinner, but for IT professionals, technology is not only their means of making a living, it’s the one thing that can make their lives easier, provide them an opportunity to make a positive impact, and support their organizations in reaching goals. Unified Communications + Software-defined Networking UC is great because I now have a single platform to handle all communications, making it easier to administrate. This improves efficiency while also being more reliable, especially when you add SDN. I never worry about losing connectivity or being out of touch because SDN reconfigures on the fly. There is no concern about missing an alert or important voice mail with this solution. Retail Solutions for Improved Customer Experience Before being able to combine powerful solutions such as biometrics, analytics and unified communications, I had to work with disparate systems to provide good customer information. Now, I am able to improve both security and our customer service programs using biometrics. Plus, the information we receive is actionable. We can empower sales associates to provide a much better customer experience in the store. And our loss prevention has never been stronger. These are both goals we have strived to reach for a while, and I am happy to see us making big strides in both areas. Biometrics Support Law Enforcement While I may be in the background, I take my position very seriously. It is important that our men and women serving our communities on the front lines have the best tools available to safely and effectively do their jobs. That is why having biometric solutions such as NeoFace® and NeoScan 45® are so important. They give us accurate information quickly so we can take proper action. Getting the bad guys off the street is important, and making sure we make the proper identification is crucial. These tools empower us to do so, and having the opportunity to support law enforcement teams is powerful. Network Solutions: SDN, Servers & Storage Empower IT By enabling my organization to use virtual machines much more efficiently, I don’t have to physically reconfigure the network. Plus, I don’t have to hard code as I used to. It minimizes finger pointing between vendors and lets us troubleshoot more effectively. In case of mergers or acquisitions, I can easily integrate two networks while still maintaining administrative capability in an OpenFlow network. Business Analytics tell the Story Before business analytics were so readily available, we were unable to provide empowering data to our customers. Using business analytics gives me information to more efficiently do my job. For example, with the ability to see historical data, we can now ascertain that the sales spike we are seeing is temporary, so I can use my existing infrastructure more effectively. I can analyze the data usage by every department, and because business owners can see information on their trends, together we can ensure we are deploying resources to accommodate their critical business goals and initiatives. It’s seamless to our internal customers, and ensures that everyone has what they need from a computing power standpoint. Uniquely NEC – #SolutionsforSociety We have a tendency to take technology for granted now, having it so readily at our fingertips. However, NEC’s major initiative to use technology to innovate Solutions for Society is a prime example of how we can use technology to create a better world. With solutions focused on transportation, water conservation, improved communication and quality of life, we are orchestrating a brighter world through technology. That is something to be thankful for! Thanks for stopping by and we would like to wish our IT professionals, friends, and families a warm and Happy Thanksgiving. Hey Buddy!, I found this information for you: "Congratulations to Irving’s New Chief of Police". Here is the website link: http://nectoday.com/congratulations-to-irvings-new-chief-of-police/. Thank you.